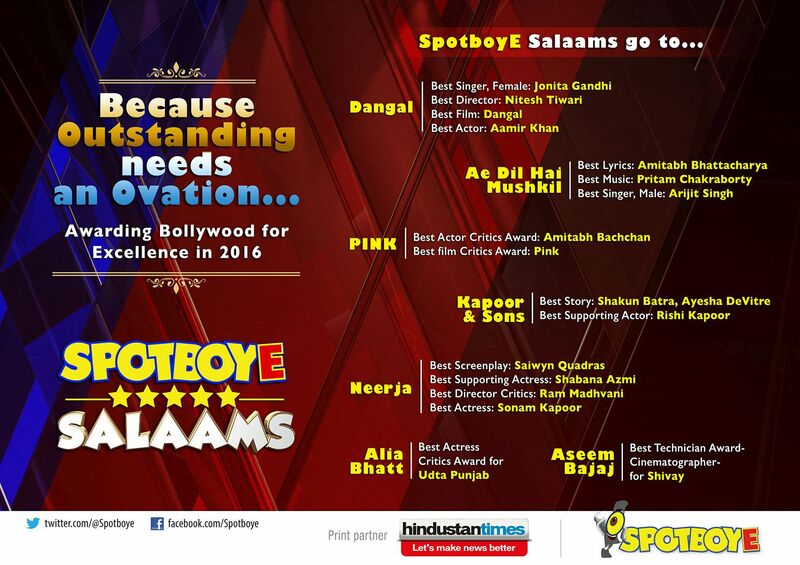 SpotboyE.com, the hottest, boldest and truest Bollywood news destination by 9X Media, is all set to honour the best in Bollywood in 2016 with The SpotboyE Salaams (awards). The Salaams will break away from the clutter of ‘song-dance performance’ and TRP obligations and reset the agenda to honour sheer talent. SpotboyE Salaams will be announced on 4th January 2017. Commenting on the initiative, Mr. Amar Tidke, Chief Programming Officer, 9X Media Pvt. Ltd. said, “We always pride ourselves in representing the best of Bollywood through music, news and views. In a short span of time, SpotboyE has created a positive impact in Bollywood for its truthful, timely and wide ranging news coverage. The SpotboyE Salaams will recognise and applaud deserving talent in Bollywood in 2016, in its inimical style of grace and dignity”. For the first year, the winners of SpotboyE Salaams have been decided by our in-house film critic Khalid Mohamed, Editor Vickey Lalwani and staffers. The SpotboyE Salaams will be concluded with an on-ground event shortly. For more action on #SpotboyeSalaams, log on to Spotboye.com, sab kuch Bollywood!